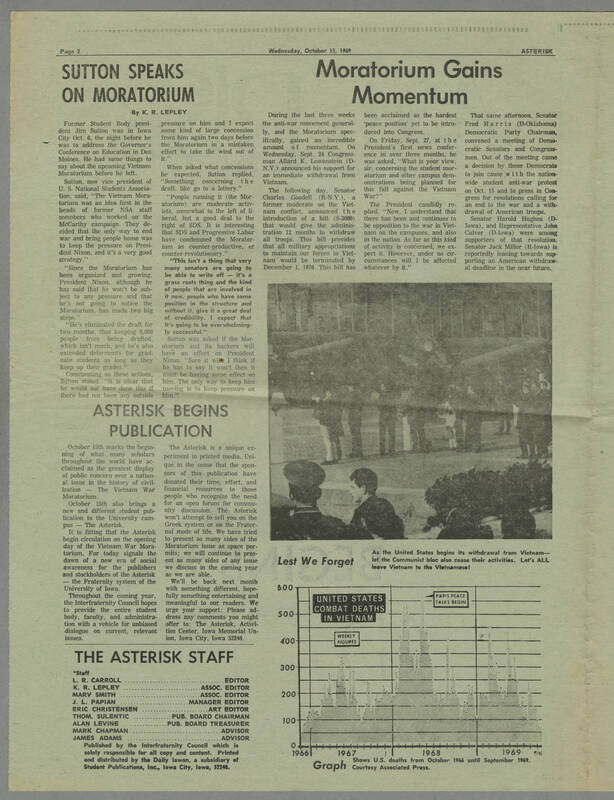 Page 2 Wednesday, October 15, 1969 ASTERISK SUTTON SPEAKS ON MORATORIUM By K. R. Lepley Former Student Body president Jim Sutton was in Iowa City Oct. 6, the night before he was to address the gvoernor's Conference on Education in Des Moines. He had some things to say about the upcoming Vietnam Moratorium before he left. Sutton, now vice president of U. S. National Students Asociation, said, "The Vietnam Moratorium was an idea first in the heads of former NSA staff members who worked on the McCarthy campaign. They decided that the only way to end war and bring people home was to keep the pressure on President Nixon, and it's a very good strategy." "Since the Moratorium has been organized and growing, President Nixon, although he has said that he won't be subject to any pressure and that he's not going to notice the moratorium, has made two big steps." "He's eliminated the draft for two months, thus keeping 6,000 people from being drafted, which isn't much, and he's also extended deferments for graduate students as long as they keep up their grades." Commenting on these actions, Sutton stated, "It is clear that he would not have done this if there had not been any outside pressure on him and I expect some kind of large concession from him again two days before the Moratorium in a mistaken effort to take the wind out of it." When asked what concessions he expected, Sutton replied, "Something concerning the draft, like go to a lottery." "People running it (the Moratorium) are moderate activists, somewhat to the left of liberal, but a good deal to the right of SDS. It is interesting that SDS and Progressive Labor have condemned the Moratorium as counter-productive, or counter-revolutionary," "This isn't a thing that very many senators are going to be able to write off—it's a grass roots thing and the kind of people that are involved in it now, people who have some position in the structure and without it, give it a great deal of credibility. I expect that it's gong to be overwhelmingly successful." Sutton was asked if the Moratorium and its backers will have an effect on President Nixon. "Sure it will. I think if he has to say it won't then it must be having some effect on him. The only way to keep him moving is to keep pressure on him."